Life on Tiger Mountain: Objects in winter may be tougher than they appear. Objects in winter may be tougher than they appear. 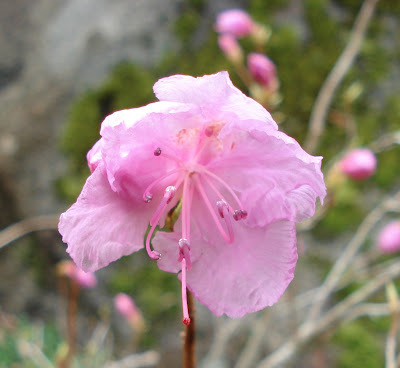 This deciduous azalea, rhododendron mucronulatum, starts blooming in February even when there is snow on the ground. 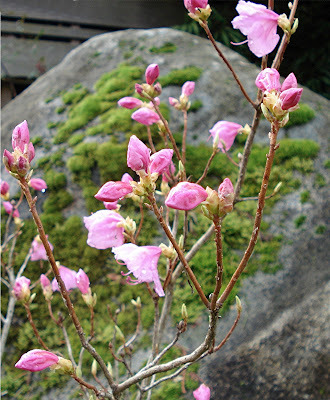 The flowers are the most delicate in appearance of anything in the garden. It always amazes me that something so fragile-looking could be so tough. What a pretty one! I've never had luck with deciduous azaleas, they've never survived the winter. Does yours have a fragrance? So lovely. There were a couple of azaleas here when we arrived, but both have died - planted 3 ft. from the trunk of a cedar tree, not exactly a friendly spot. Why are some deciduous and others not, I wonder? @Catherine: I have three deciduous azaleas and they all seem to thrive on borderline neglect. No fragrance but because they bloom around the same time as hyacinths and daphne odora, fragrance would probably be overkill. @Karen: I think it's just an enormous genus and most of the hybridization has been done with the evergreen varieties. Perhaps we should have a SAGBUTT gettogether at the Weyerhauser rhodie garden? Things certainly are early this year. Was thinking about spading up the garden this weekend, but... Today is certainly a dose of reality. Found Irving's book in Bellingham long ago...great read.